Episode 36 of the Paddock Pass Podcast is out, and covers the fantastic racing at the Czech GP in Brno. Helping us dissect through all the racing news, we have Neil Morrison, Scott Jones, and David Emmett on the mics, giving their great insights from their trackside perspective. The guys obviously talk about Cal Crutchlow’s historic win, and how important the right tire choice was in the MotoGP race results. The guys also obviously discuss the performance of the Michelin tires, and what caused so many of the issues we saw in the Czech Republic. Just as important as choosing the correct tire for the race, conserving the tires over the race distance was also crucial. The guys compare the efforts of Rossi, Marquez, and Barbera in that regard, and show how their efforts ultimately paid off. We finish the MotoGP discussion with a look at Jorge Lorenzo’s performance in the wet, and dismiss a couple notions about the Spanish rider. The show then ends with some time given to John McPhee’s excellent win in Moto3, as well as the results in Moto2 – and how they affect the Championship standings. 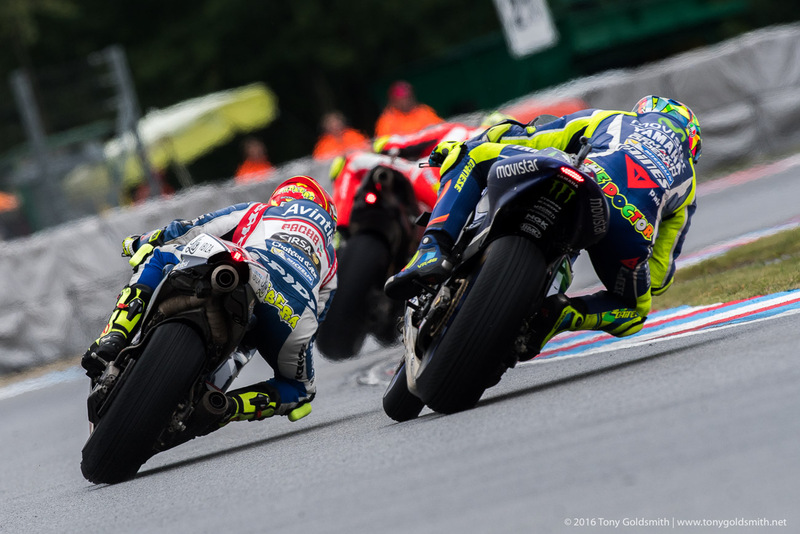 The tire degradation during the MotoGP race at Brno was still a hot topic on the test on Monday, after so many riders suffered problems during the race on Sunday. We asked most of the riders who tested on Monday what they felt about the tires, and whether they were safe. We also spoke to Nicolas Goubert, Michelin’s technical director, and he explained why he felt that some riders had suffered problems, while others had been able to finish the race. The comments below are offered without any further commentary. I do not wish to cloud the judgment of those reading the comments by first setting out my own theory of what happened. The comments stand on their own, and should be read as such. After a tough race on Sunday, managing tires on a drying track, around half of the MotoGP grid headed back to the track on Monday for a day of testing. Not everyone was enthusiastic about that. “Usually we hate Mondays, and this is a Monday that we hate,” Danilo Petrucci told us with a wry grin on his face. He pinpointed why testing made a lot less sense for satellite riders than for factory teams. 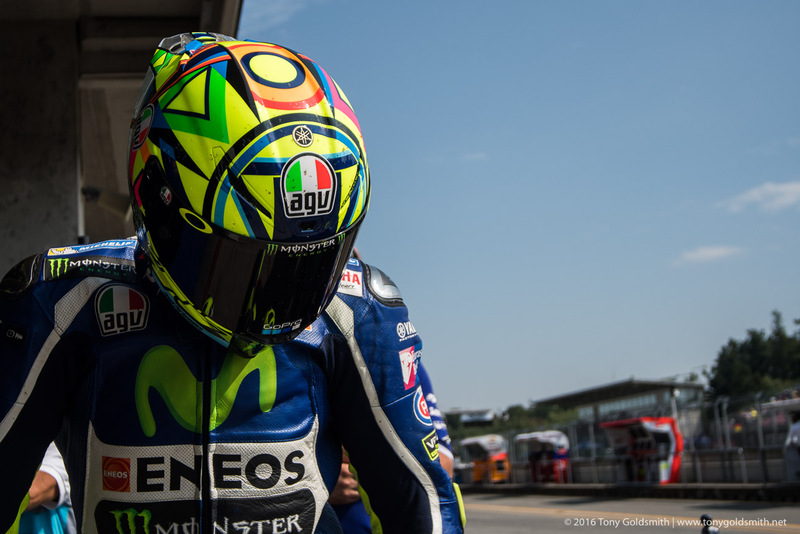 There were a lot of firsts at Brno on Sunday. Perhaps the most consequential was the fact that we saw the first wet race in the MotoGP/500 class ever to be held at the Masarykring, the modern purpose-built circuit which replaced the old road circuit at Brno. That had a lot of knock on effects: we saw a surprise winner in the premier class, a shift in the championship, and a long race of strategy, where some riders got it spot on, and others got it horribly wrong. The MotoGP race was both fascinating and entertaining, and an object lesson in how changing weather can make morning warm up lead riders down the wrong path. On a sodden track, with the rain still falling heavily in the morning, there were serious concerns among some riders that the softest compound wet tire which Michelin had brought was not going to be soft enough to provide enough grip. “This morning with the extra soft the tire was completely new after nine laps,” Andrea Dovizioso said. 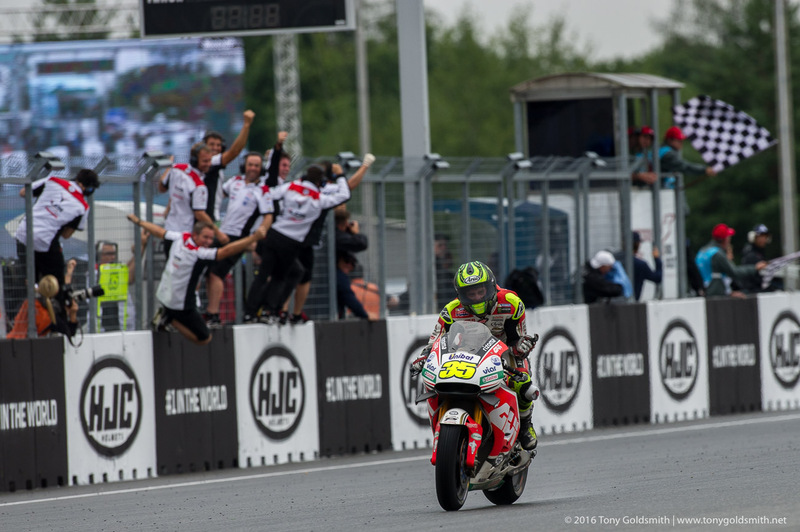 It rained throughout the Moto3 race – which provided enormous entertainment, a first-time winner and another first-time podium visitor – and kept raining during Moto2 – a less exciting affair, but one which still managed to shake up the championship. The rain eased off on the final laps of Moto2, then just about stopped in the break between the end of the Moto2 race and the start of MotoGP. It was a welcome development for us hacks: chasing through the paddock to talk to Moto3 riders after the race, we had endured a soaking. The same run down to the other end of the paddock in search of Moto2 riders was a far more pleasant affair. The need to scurry from garage to garage under the shelter of balconies was gone. After he and his teammate Jorge Lorenzo had looked well in control of proceedings after the first day of practice at Brno, Valentino Rossi warned the media against drawing premature conclusions. “I think it’s just Friday, it’s a long way to Sunday,” he said. We in the media ignored his warnings, of course, and painted a technicolor picture of a race where the Movistar Yamaha riders took back a hefty bunch of points from Marc Márquez, reigniting the championship. Then Saturday happened, and Valentino Rossi turned out to be right again (and not for the first time, I might add). Friday had been just Friday. It was indeed still a long way to Sunday. Saturday, a stepping stone on the way to Sunday, helped turn a lot of things around. Jorge Lorenzo is still fast. So is Valentino Rossi, though not quite as fast as he had hoped. Andrea Iannone is a genuine threat for the podium, or even his second win in a row. Maverick Viñales could still get up front and complicate things, though he has a hill to climb after a problem with the brakes saw him qualify on the third row of the grid. But any illusions the Movistar Yamaha men had of clawing back points from Marc Márquez will have to be shelved. Not only will the Repsol Honda rider start from pole on Sunday, but he also has the race pace which was missing on Friday. All thanks to a breathtaking lap of Brno, and a large set of wings which helped cure some of the worst problems with the Honda RC213V. 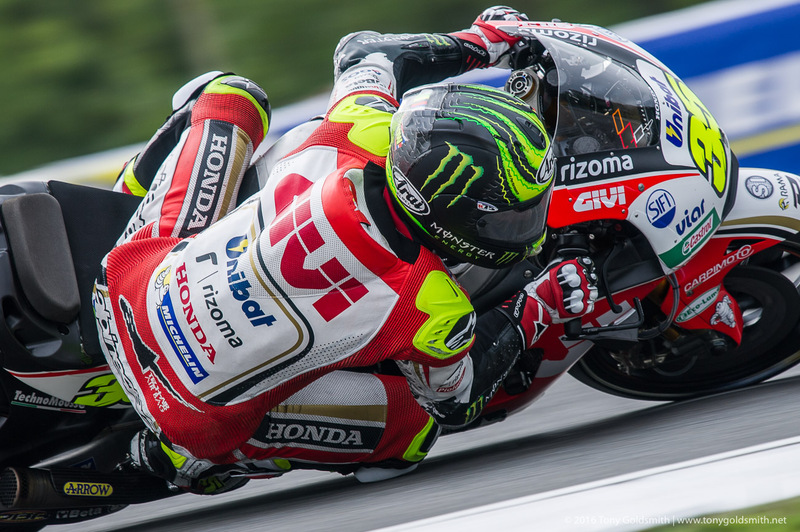 Honda have won four of the five last races held here at Brno. Casey Stoner has won one race, Marc Márquez has won one, and Dani Pedrosa has won two of those races between 2011 and 2015. After the first day of practice for this year’s race at Brno, Marc Márquez sits atop the timesheets, with a lead of a tenth of a second over Andrea Iannone, and a shade more to Jorge Lorenzo. Does that mean that a fifth win for Honda is on the cards? For the answer to that, see Marc Márquez’s improbable save during FP2 at Brno. As he turned in for the penultimate corner at Turn 13, he lost the front of his Repsol Honda RC213V. With the steering at full lock, he hung on to the bars as his right foot slipped off the peg, trying first to lever the bike up with his elbow, then with his knee. Eventually the front slipped sideways, gripped, and the bike jimmied itself off the horizontal. It had lost just enough speed for Márquez to regain control, and buck it back to the outside of the corner, and head straight into the pits. It is but a short trip up the road from Spielberg to Brno, but it is a journey between two very different worlds. From the hyper-modern facility at the Red Bull Ring, to the frayed-around-the-edges buildings of Brno. From a track which has been missing from the calendar for the best part of twenty years to a circuit which has seen racing almost since its inception, where teams often come to test. From a track with a paucity of corners, all hard braking and acceleration, to one which flows from corner to corner, where bikes mostly exit in third gear when getting on the gas. The starkest difference between the Red Bull Ring and Brno is the layout. Both tracks snake up and down hillsides, but where Austria is a track stuck up against a mountain, Brno is a winding road which threads its way through hills and vales. Where Spielberg is basically seven corners, three of which are almost hairpins, all fourteen of Brno’s corners are long and flowing. Ironically, Brno’s flowing layout makes it somewhat more simple to set up a bike for it. All of the corners are similar, with no camber and needing the same approach.